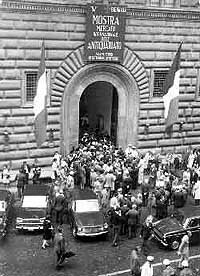 The Mostra Internazionale dell'Antiquariato of Palazzo Strozzi was launched in 1959, after which it was held every two years in the prestigious premises of Palazzo Strozzi up to 1993. The Fair was the brainchild of Luigi Bellini Sr., designed to attract to Florence the very best in the international antiques world, and it established itself by offering the finest range of choice in the collecting and antiques sector. The overwhelming success of the first exhibition, and of those which followed (in 1973 � the 8th Biennale � notched up the exceptional figure of over 122,000 paying visitors), marked the start of a market season increasingly oriented towards the Antiques Fairs. The originality of the idea, accompanied by an astute selection of the antiquarians, transformed the Fair into a cultural and fashionable event that could not be missed, to the extent that the Florentine Fair was visited both by the members of the international jet set and by a crowd avid for curiosities, knowledge and marvels. 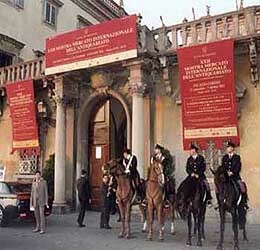 The international triumph was triggered by the fact that it was held in Florence, a city always close to the heart of the international world, and in one of the historically most famous and important Palazzi in the city; beyond this it was also accompanied for the entire duration (the early Fairs went on for one month) by a series of highly attractive cultural and society events. In line with the new demands of the market, the duration of the Fair has been modified over time, up to the current nine days. The difficulties in the utilisation of Palazzo Strozzi, since adaptation work was being carried out, meant that in 1977 the antiquarians had to move to Palazzo Giuntini (now the Grand Hotel), after which they returned to the original site up to 1993. We should recall the memorable Biennale of 1987, when Guido Bartolozzi took over from the Bellini brothers as the General Secretary. Nevertheless, when Palazzo Strozzi became definitively unavailable, in 1995 the Fair had to be moved to the Palazzo degli Affari, a fine building designed by Spadolini, but entirely unsuitable for an antiquarian fair of the level of the Florentine Biennale. The following two Biennali (1997 1999) were held in Palazzo Corsini sull'Arno; however, despite the efforts, the commitment and the utilisation of this highly evocative Palazzo, the results failed to come up the level of what was happening elsewhere in Europe. In the first place the Palazzo Corsini Fair decided to alter the display image, entrusting the direction to Pier Luigi Pizzi, who brought about a masterpiece of restyling for the exhibition of 2001, with the introduction of a new pavilion in the entrance courtyard of the Palazzo. Beyond this, the major concern of the new Secretary was to maintain the international dimension of the Biennale, not only in terms of the participation of foreign merchants, but by enabling the Italian antiquarians to enjoy the same rights as their foreign colleagues, offering them a prior inspection of the works on display so that they could be provided with export licences before the start of the Fair. In this regard we have to express our most heartfelt thanks to the Director General Mario Serio, and also to the Commissioner of the Polo Museale Fiorentino, Antonio Paolucci, and to Angelo Tartuferi Director of the Export Office. Despite the dramatic events which rocked the western economy following the attack on the Twin Towers just a few days before, the results of this reborn Biennale became rapidly evident. Already in the 2001 edition antiquarians who had for some years deserted the Florence Biennale had returned to the Palazzo on the banks of the Arno. The response from the collecting sphere was of comforting optimism. In the 2003 edition the reacquired prestige was consolidated in the ongoing requests from both Italian and foreign exhibitors who were highly desirous of exhibiting in Florence. The by now certain attendance of a considerable number of foreign firms, as well as the extreme guarantee of excellence which we have indicated as desirable, also ensures the indispensable percentage necessary for qualification as an international Fair. 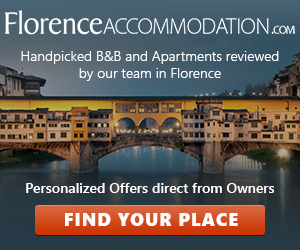 And that Florence should not have to renounce this definition is demonstrated by the analysis of the facts: historically, Florence has a cosmopolitan vocation which has always enriched it in cultural and economic terms, making it the centre of the world. And we should not overlook the fact that there are nearly 30,000 people who find employment in the world of the Art market and its allied industries, a heritage of the city and the Region which has to be maintained and protected. Nor should we overlook the inaugural evening which is scheduled to be well worthy of the event, and through which the Fair manages to offer the restoration of important works of art housed in Florentine museums, continuing what is by now a consolidated tradition. Dates and opening hours: From 30th September to 9th October.